In May this year, The Telegraph and the Good Thinking Society reported that fake cures are being offered to people with cancer in the UK, prompting calls for a criminal investigation. According to the investigation dangerous products were claimed to offer a 100% cure for skin cancer at a similar event. Both black and red salves are corrosive and essentially burn off layers of the skin and surrounding normal tissue. They can destroy large parts of the skin and underlying tissue, and leave significant scarring. Greed, unblushing impudence, gross ignorance, systematic falsehood, and callous indifference to human life and suffering, were the features they had displayed — the genuine lineaments of the quack. 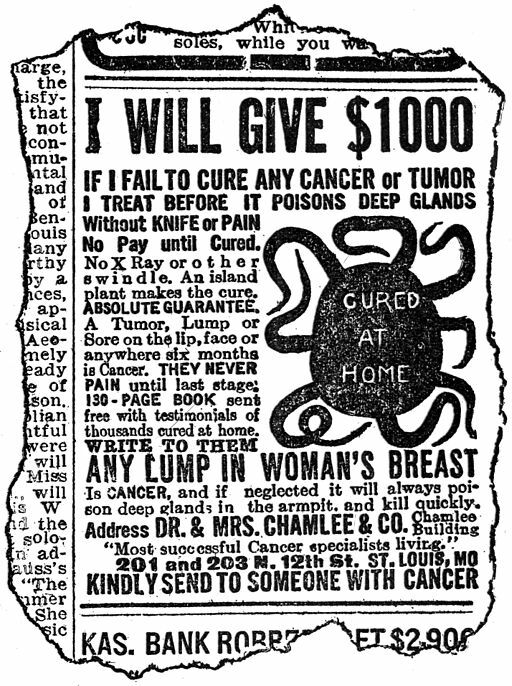 Cancer quackery advert, published 1912, Journal of American Medical Association. Wellcome Library, London. Rebecca Cohen was not the last. Back to the present day, black salve is listed as a fake cancer ‘cure’ by the US Food and Drug Administration (FDA). Dr Stephen Barrett at Quackwatch has documented some of the cases where people have used these products, with horrifying results. A quick google took me to many websites selling the stuff that claim black salve can cure all types of cancer. This information is supposedly suppressed by the monolith of the pharmaceutical industry, medical establishment and governments because the ingredients are natural and therefore profit-less, a familiar claim debunked here by Cancer Research UK. In 1911, the BMJ published an article by Dr EF Bashford, laboratory director at the Imperial Cancer Research Fund (the ICRF merged in 2002 with the Cancer Research Campaign to form Cancer Research UK). In ‘Cancer, credulity and quackery’, he takes a pretty comprehensive look at the cancer ‘cures’ sent to the ICRF, concluding that ‘Humbug is rife indeed’. when claimants did comply with these requests, ‘without exception, the claims so confidently made have been without any scientific justification’. The number of quacks outside the profession also engaged as “cancer curers” cannot be estimated, but must be very much greater than the several hundred correspondents who were either sufficiently honest, impertinent, or naive as to bring their proceedings to my notice. BBC News website. Former NHS worker still selling ‘miracle cure’ bleach, published 14 September, accessed 15 September 2015. Bashford EF. Cancer, Credulity, and Quackery, BMJ 1911; 1(2630): 1221-1230. Cancer Research UK website. Don’t believe the hype – 10 persistent cancer myths debunked, accessed 15 September 2015. The Evening News, Sydney, via Trove website. The Cancer Case. “Dr” Hood and son. At the Central Criminal Court, 27 April 1892; and The Cancer Case. “Dr Hood and son. Heavy sentence, 4 May 1892. Food and Drug Administration website. 187 Fake Cancer “Cures” Consumers Should Avoid, accessed 15 September 2015. Food Standards Agency (UK government) website. Agency warning on chlorine solutions, accessed 15 September 2015. Good Thinking Society website. Trading Standards action on ‘Miracle Mineral Solution’ conference in Surrey, and Daily Telegraph: “MPs call for police inquiry into bogus ‘cancer cures’”, both accessed 15 September 2015. Quackwatch. Don’t Use Corrosive Cancer Salves (Escharotics), accessed 14 September 2015. Surrey County Council website. Warning over bogus ‘miracle cure’ which could be on sale in Surrey, accessed 15 September 2015. The Telegraph website. MPs call for police inquiry into bogus ‘cancer cures’ offer by alternative medicine practitioners, accessed 15 September 2015. Therapeutic Goods Administration (Australian government) website. Black and red salves in treating cancer. TGA warns consumers about the use of Black and Red Salves in treating cancer, accessed 15 September 2015. Great post. It never ends. Did you hear the one about Wayne Dyer ‘s remote psychic surgery to cure his leukemia. Well he claims the electromagnetic forces emanating from John of God, 12,000 miles away were so powerful that they destroyed his $17,000 Panerai wrist watch. Dyer, John of God and electromagnetic energy? A real miracle!